With all the excitement building up for KGI day in Mumbai and other cities, it was a little scary to see all those dark clouds building up for the famous Mumbai rains which can simply disrupt all normal life. We had been praying for a bright sunny day on 28th August, however the rain gods had other things in mind! Braving the flooded streets, erratic schedule of local trains and uncertainty our volunteers reached the venue in time their faces shining happily with the joy of showing off and sharing their prized harvests!As Anju Venkat later correctly observed, she was here to talk about not just a food but a special harvest which was as dear to us as were our babies! Our group from Nana Nani Park gathered early morning at the Chowpatty, harvested the produce and joined the rest of the gang at Maharashtra Nature Park. The community garden at MNP awaited everyone with healthy, happy harvests... Thankfully the rains had taken a breather...while we toured the garden! brought by all our volunteers. Leafy vegetables like colocasia, variety of spinach, Basella leaves. Vegetables like ladies finger, onions, sword beans, cluster beans, pumpkins. Herbs like tulsi, lemon grass, ajwain, basil, mint, aloe vera, beetle leaves. Fruits like papaya, guava, lemon, sweet lime, passion fruit, star fruit. Nuts and seeds like ground nut, sesame seeds. A brief talk by Uday Acharyaji on the basic purpose of celebrating the World Kitchen Day, dotted with his heart warming and disarming sense of humour brought laughter amongst all those present. So very aptly the session began with a beautiful song by Swati ; the words so befitting the emotions of fellow gardeners when they see their blooms first thing in the morning. The Health Awareness center was established in 1989 by Dr Vijaya Venkat who is a pioneer in the promotion of of holistic health principles. The highlight of the occasion were the talk and demos by ‘Anju Venkat’, a nutritionist at the Health Awareness Centre for the last 16 years. Drawing an apt and convincing analogy between ‘Amrut mitti’ and food, she explained that health is the result of healthful living or living according to the laws of nature. She spoke about the importance of consumption of organic food and ways of cooking that would preserve its nutritive value, bring out its flavours and colours to the maximum and provide optimum nourishment. This was followed by a cookery demo conducted by her, utilizing the plant yield contributed by the volunteers. A complete meal with.. Papaya salad, Bhindi salad, Dhokla, Raw banana cutlets, Date and tamarind chutney, herbal tea....Yummy beetlenut leaves laddos.... Never thought we can have such a dish! 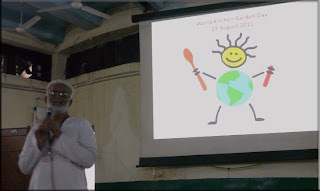 The afternoon session left everyone awe-struck by the premier screening of the documentary on the ‘Urban leaves’- "Reap what you sow, eat what you grow" filmed by Suma Josson , that would not fail to inspire anyone who watched it. The celebration ended with a fervent group discussion eliciting from the participants not only their ideas but also assurance to carry the movement forward by spreading awareness and educating minds about the merits of urban farming. All in all, a highly enjoyable, gratifying, inspiring and fulfilling experience that made everyone depart in a sunny spirit despite it being one of the wettest days of the season. Still awaiting reports from friends in Bhopal, Nasik, Chennai and Kolkatta. Watch out for them!